We got some wet, sloppy snow just in time for Thanksgiving. Most of it has melted at this point but it was pretty while it lasted. I had heard chickens don’t likw snow so I was wondering how the Dashwoods would react. They don’t like snow. But they weren’t going to let it stop them from getting out of their run. The desire to be out and about was greater than the desire to not walk on cold snow in bare feet. I figured they were smart enough that if they were cold and uncomfortable they would go back in the run, or even into the coop where it was warm and dry. I overestimated their intelligence just a little bit. I had shoveled snow off the main garden path as best I could. The path is not a hard surface which makes for a bit of a challenge. The Dashwoods could scratch along the path and at the sides and not have to walk in the snow. Of course they did not stay on the path. At one point we looked out the window to see Elinor and Mrs. Dashwood standing in the middle of the deck. Elinor had one foot up and tucked in under her and it looked like she was shivering. Obviously they didn’t know how to take care of themselves. Bookman and I put on our boots and walked out to lead them back to the run and close them up. All of them went racing after Bookman thinking he had a treat for them. All but Elinor who continued to stand on the deck with her foot up. So I scooped her up and tucked her under my arm and walked to the run with her. She did not complain about getting a lift. We looked at her foot to make sure she hadn’t cut it on ice or a rock or something. It was fine. She was just cold. They were not pleased to be closed up in the run, but after a few minutes they all went into the coop to warm up a little. Silly chickens. Today it has been foggy and damp and the snow is almost melted away. The Dashwoods have been out roaming the garden in the fog all day. When Bookman and I went out to clean the coop and to do some other things, they all followed us and stood around watching to make sure we did everything right. When they were done supervising and it was clear treats weren’t going to magically appear, they left us to go scratch around the garden again. 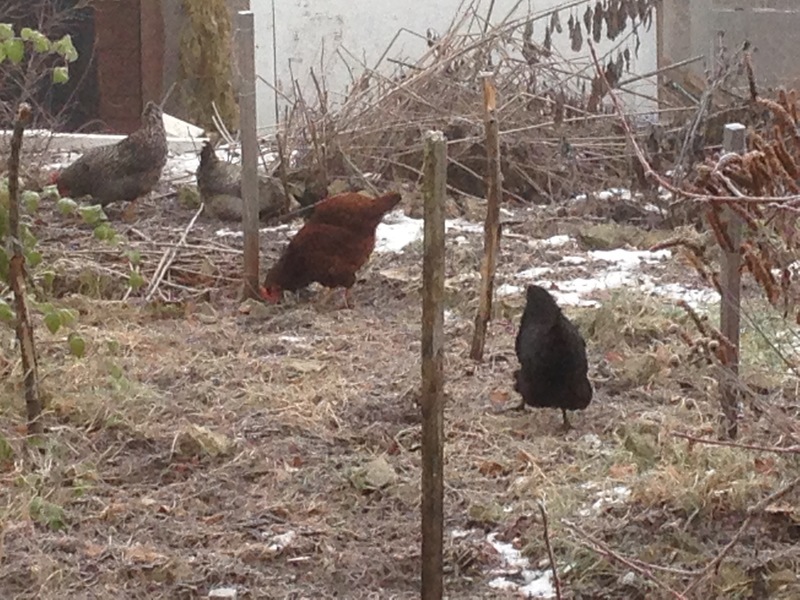 The ground is beginning to freeze and they will not be happy chickens when they can’t scratch in the dirt again until April. I will have to get creative with hanging vegetables in their run that will swing around when they peck at them in order to keep them entertained. It is kind of nice at the moment to not have to worry about garden chores. Other than taking care of the Dashwoods, which doesn’t take all that long, I have some freed up time for reading now. And noticing all the things around the house that need to be done. Funny how those escape notice when you spend so much time outside. Chicken identification note: Mrs. Dashwood is the black and white one with the bright red comb, Marianne is the black and white one with the white head, Elinor is the red/brown one, and Margaret is the all black one. There was some big cycling news the other day. The Dirty Kanza, a 200 mile/322 km gravel race in Kansas that just celebrated its tenth year made an exciting announcement. They’ve noticed that only about 10% of their riders are women but that the women finish at the same rate as the men and with times just as good. There are not an abundance of women in the sport of cycling to begin with and an even smaller number who pursure ultra-distance cycling, gravel riding, and unsupported races. Combine all those three things together and well, 100 women get lost among the 1,000 riders at the Dirty Kanza. So the organizers announced that 200 spots will be reserved for women. This is huge, not only because they want more women to participate, but because the 1,000 rider cap is usually met within hours of registration opening. To reserve 200 places exclusively for women is really awesome. If all those places aren’t full in a month or so, they will be opened to general registration. Now, I’ve heard of the Drity Kanza, it’s a big deal race and just finishing it is an accomplishment. I’d never thought I would be interested in riding it and if I were, well, with a cap of 1,000 riders, what would be my chances? This of course changes everything. Oh no, I am not going to Emporia, Kansas in June 2017. I want to do 200 miles on pavement first. But maybe 2018. I will have turned 50 that April and wouldn’t riding the Dirty Kanza be a great belated birthday present? I had no idea chickens don’t like snow, but I guess it makes sense. I wouldn’t want to walk around in it in bare feet either. We haven’t had any snow yet, but I hope we’ll get some soon. AMB, at first they avoided it as much as they could but that limited them to where they could be so eventually they started walking across it looking for places they could dig. We are getting rain today, so weird, which means all the snow will be gone and that will make them happy for a little while at least. I’m sure you will get some snow soon, it is only a matter of time at this point! Go Stefanie! Thats one of the bestest ways to celebrate a 50! My flatmate did para gliding to celebrate 40…and I think Dirty Kanza would be awesome for you! 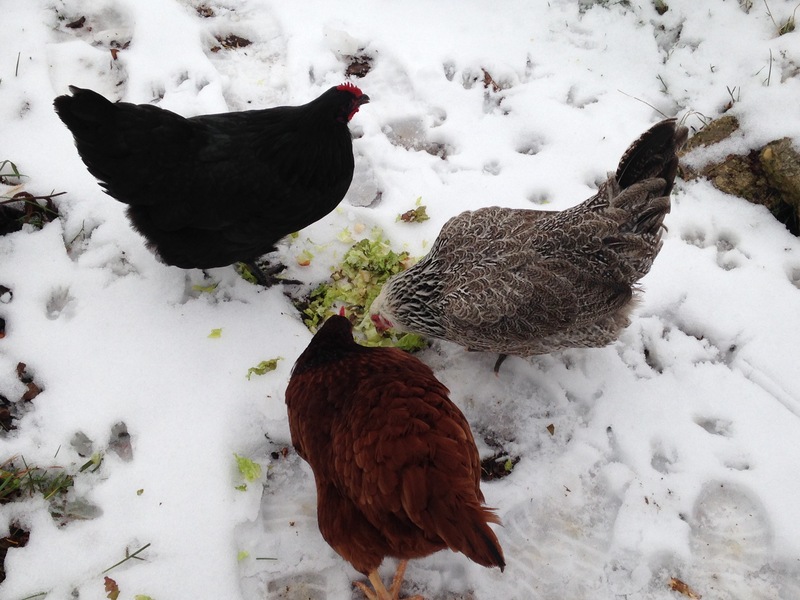 Chickens do not like snow but I am sure they will figure out a way to entertain themselves until April! cirtnecce, heh, thanks! It is something to aim for! The Dashwoods are not the most creative birds so they will need help in the entertainment department or they might decide pecking at each other makes good sport. I just cracked up laughing when you said you’d overestimated the chicken’s intelligence. Re: the race, I think it’s exciting to have a great milestone / objective in the future to get you motivated! Go for it!! smithereens, heh, I assume most creatures have a basic level of intelligence that includes self-preservation but apparently the Dashwoods are like children and just don’t know any better at this point. I am hoping they learned a few things but that might be asking a lot! How long do you think it would take you to do 200 miles? You should go for it–something to train and plan for! 🙂 I think Elinor is quite a smart chicken–she got you to carry her into her warm coop! But generally speaking, they are silly girls! Danielle, well, it depends. For the race on pavement next summer I am aiming for 14 hours assuming there is no bad weather and wind. For the Dirty Kanza, it all depends on road conditions and whether there is deep mud or other bad patches that require carrying the bike instead of riding it. No matter how you look at it, it is a very long day. heh, you are right, Elinor might be smarter than I thought! These poor dumb Dashwoods! They’re lucky they have y’all looking after them. 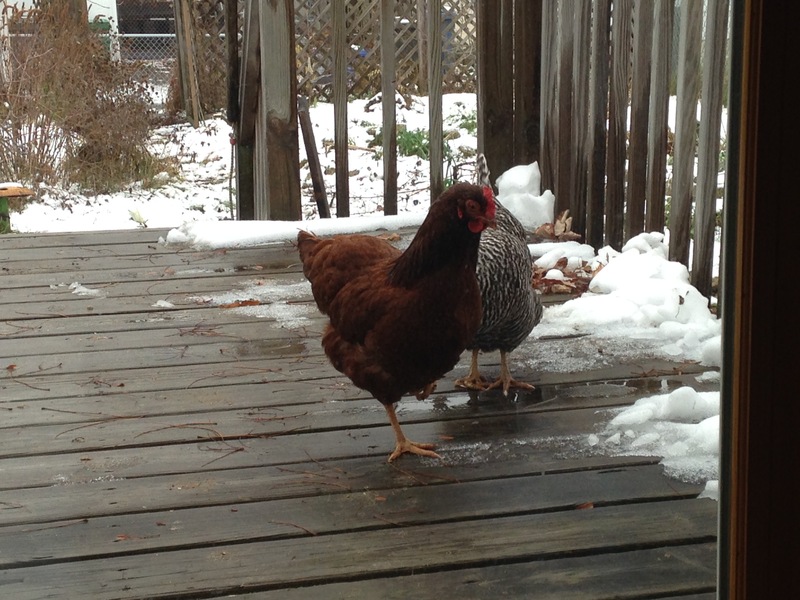 I had no idea chickens didn’t like snow either but thank goodness they have you guys looking out for them! And, I think that ride would be a great way to celebrate a big birthday! Lovely stuff about the dear old Dashwoods. Great news about the Drity Kanza and good luck with your ambition for 2018! Ian, they are fun and keep things lively. thanks! We’ll see how it all goes! Iliana, yeah, we kept an eye on them to make sure they were ok. Once it gets really cold I know we are going to be super paranoid about them at first! Again you’ve made me laugh with ” I overestimated their intelligence just a little bit.” I guess you only learn by experience. Silly Elinor standing there. I thought she’d have more sense! !